If you have a digital camera, be sure to take lots of pictures (in the hopes that at least some will turn out well - and you can delete the rest). Don't be afraid to snap shots throughout the event, and even let the kids take a few of their own. 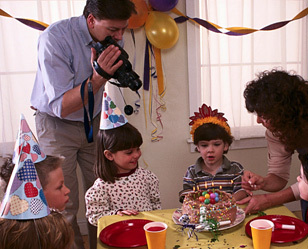 If you're having a large party, buy a few disposable cameras and ask some of the parents to take pictures for you. You'll get different perspectives of the party than if you just take pictures yourself. It's not necessary to include everyone in each picture. Focus on small groups and avoid posing the photos. Candid photos will capture the laughter and the mood of the party best! If using regular film, remember to order double prints so you can send them to guests afterward. A popular idea is to take a photo of each guest with the birthday child, and later send that photo to parents along with a thank-you note. You can make this process even quick by using a Polaroid camera, or by taking a digital picture of each guest plus the guest of honor right away when the guest comes in. During the party, have a computer-savvy sibling or parent print out the pictures on glossy photo paper and attach to party favors, so that you can send each guest home with a photo! If you have someone handy with basic web design, you can even build a party page and temporarily post the pix in a gallery after the party. Avoid videotaping every moment of the party, but feel free to film a few movie clips with your digital camera or similar. Choose your moments wisely...hours of footage of gifts being unwrapped is dull, but a few great action-packed moments of games in progress, or the traditional candle-blowing of the cake make for video-worthy footage.